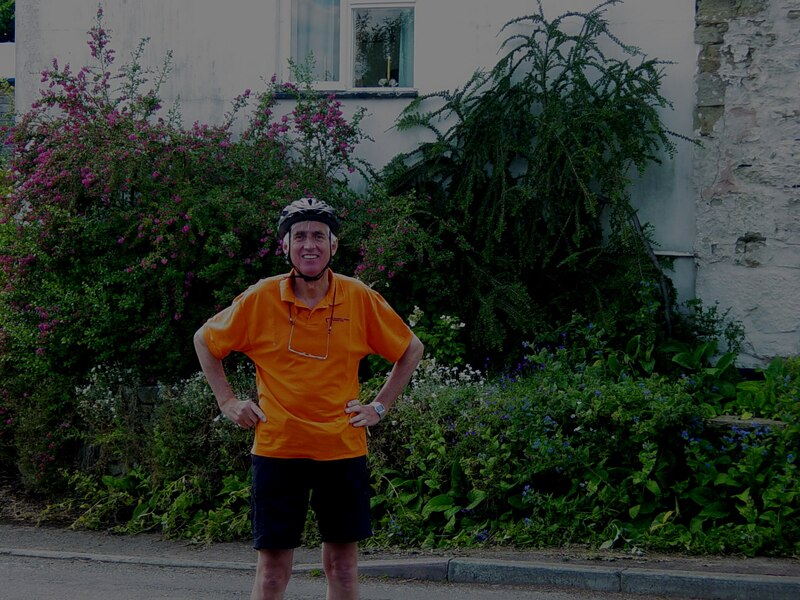 My brother Chris and I chose to holiday round Hereford because it is roughly halfway between my home in Criccieth, North Wales and his in Plymouth and was accessible by train so I could transport myself and my bicycle there. Hereford tourist information had provided us with a map of the county with several cycle routes and Chris planned our 6 days’ cycling armed with this and 4 Ordinance Survey maps, trying as much as possible to keep away from major roads and steep hills as indicated by close contour lines. We both were equipped with two rear panniers and front and rear bags too. We had decided to travel light and to cycle in our newly purchased padded cycle shorts. 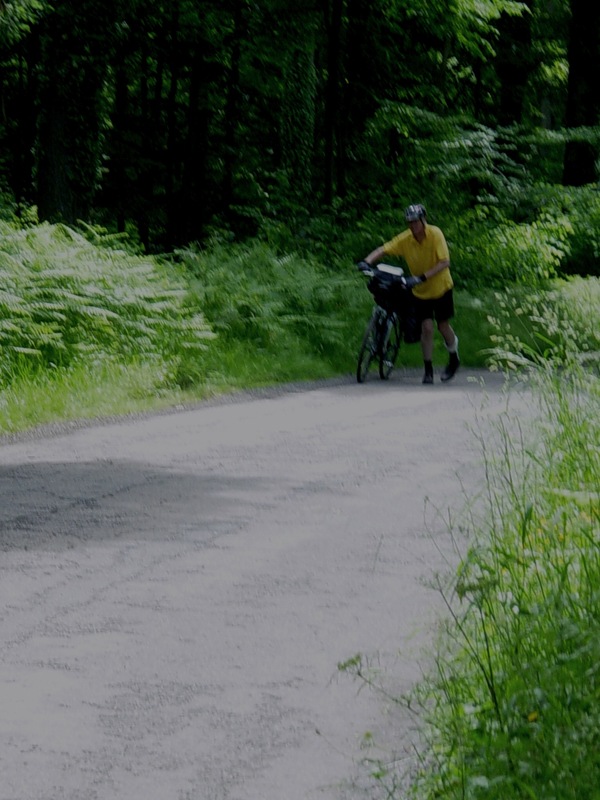 Chris had a cycle map holder between his handlebars and had marked out the routes on his OS maps. Chris’ son, Jeremy, happened to live in Hereford so he was able to leave his car behind his house. We set off from there after lunch and cycled about 18 miles to Ross-on-Wye, encountering one very steep hill en route. The traffic, on our arrival was horrendous, so we dismounted and I found a suitable hostelry whilst Chris guarded the bikes. 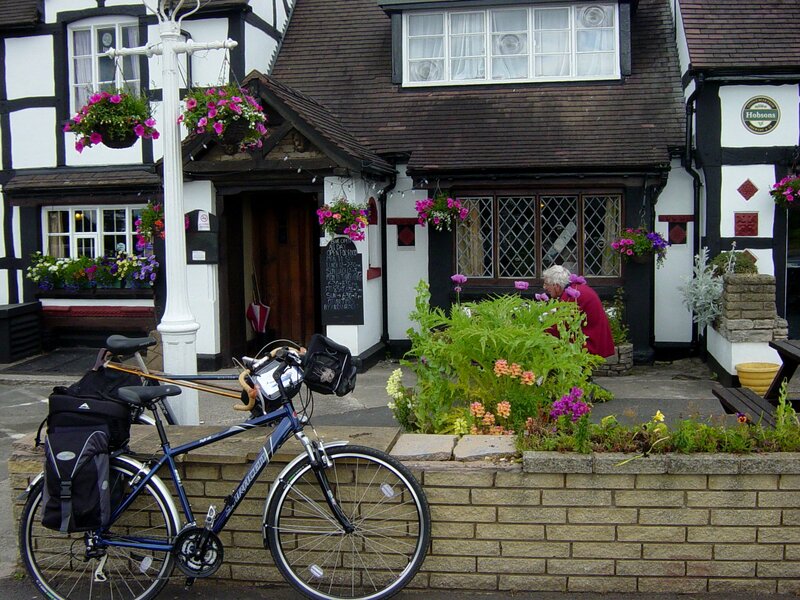 We stayed at the Kings Head Hotel and stored our bikes in their garage. They put us in a family suite at the top floor with a double bedroom leading to a bathroom and then to a twin room. Next day we set off after a full English breakfast into bright sunshine. Although it was rather early we stopped for coffee at a lovely private house whose hosts were having a charity event for Arthritis Research Campaign. Our route followed the M50, at a distance. We journeyed through some wonderful woods although the route was tricky with lots of steep ups and downs. 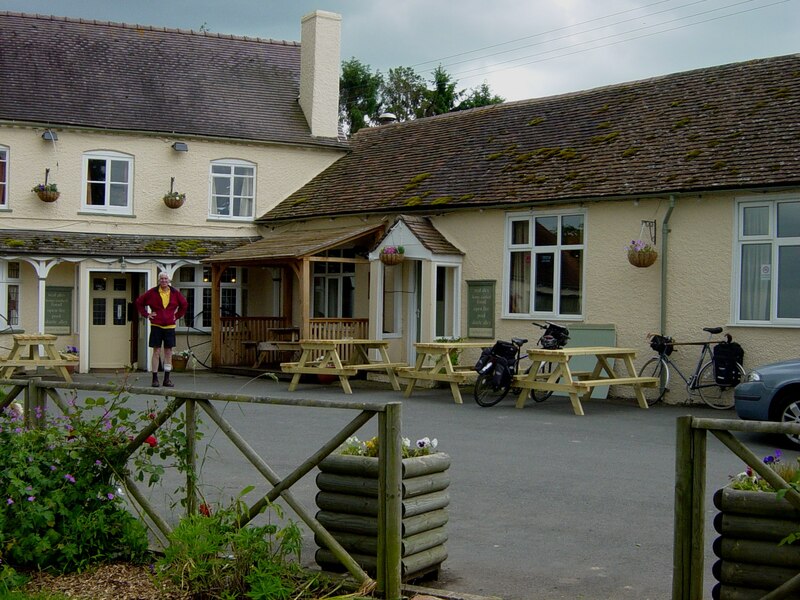 Our route took us through Compton Bishop, Kempley and Much Marcle and we managed to find a decent pub for lunch. Ledbury, again was very busy – I suppose we arrived at rush hour – and we struggled to find accommodation as Talbot Hotel I ruled out as too expensive. The place we chose was comfortable but in very poor condition – a fridge door left on the landing, the mirror under not over the washbasin etc. – and was not particularly cheap. I decided Chris should choose the next night. My front tyre was flat next day and as I thought I’d had a slow puncture the previous evening I just changed the tube. 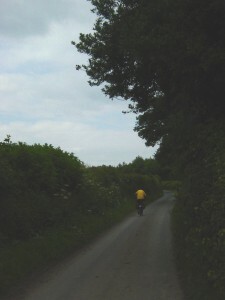 The way out of Ledbury was an old railway line which reinforced how pleasant it was to get away from cars. 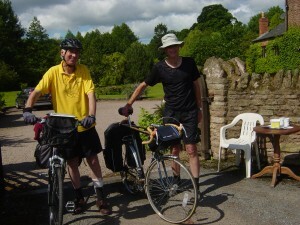 We had a long ride planned – about 30 miles – and made Bromyard for lunch. Although we ordered sandwiches, at just under £5 these seemed expensive, they came with chips and salad as well. This seemed to be general in the area. A pleasant enough chap, obviously alcoholic, chatted to us throughout our stay. Bromyard has a fair number of historical buildings but the overall effect was a little rundown. We made Leominster early evening having had a really exhilarating day. The lanes were lovely and although we did a bit of bike pushing there were enough long downs and flats to help us on our way. At one point we followed a farm track which had an exit but unfortunately only on the map so we had to turn back. The farm at the end of the track was a real mess. Sad really. Chris chose to stay in a Best Western – the Talbot Hotel – a real contrast after the previous night but overpriced for what it had to offer. We had a meal there too and drank their beer at £3/pint. The route planned for our next day was curtailed as being too long and too hilly but was still close to 30 miles and ended up at Ludlow. 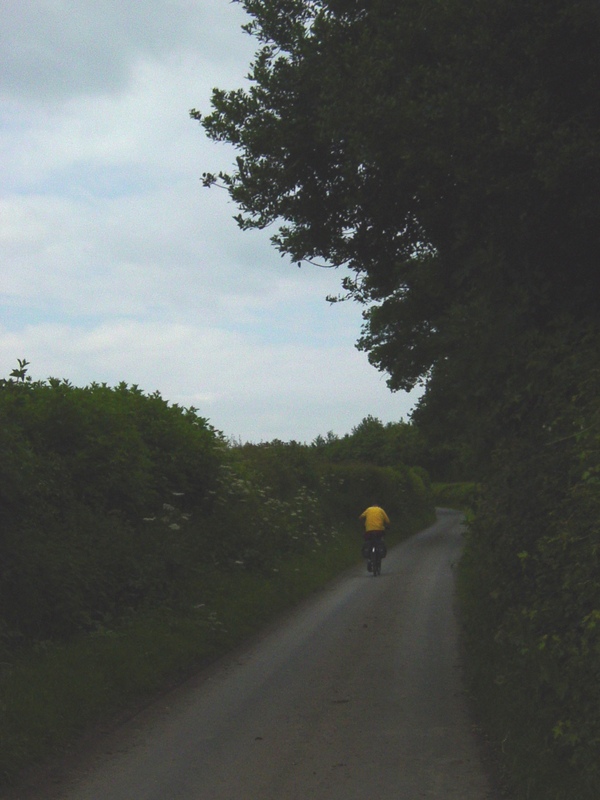 We had a really good day’s cycling going through Eyton, Luston, Ashton,and Orelton and traveling along Eye Lane, Tunnel Lane, Green Lane and Woodhouse Lane. We arrived early and soon found very pleasant lodgings at an inn in the centre of town. We then perambulated around the place – very lovely and not at all down at heel. Chris was entranced by a very posh wedding at the castle and suggested we join one of the coaches taking guests to the reception. I wanted to investigate the Youth Hostel to see what kind of accommodation they offered. En route there we visited the Priory and were invited to join the service where some Tanzanian musicians were playing. We politely declined. 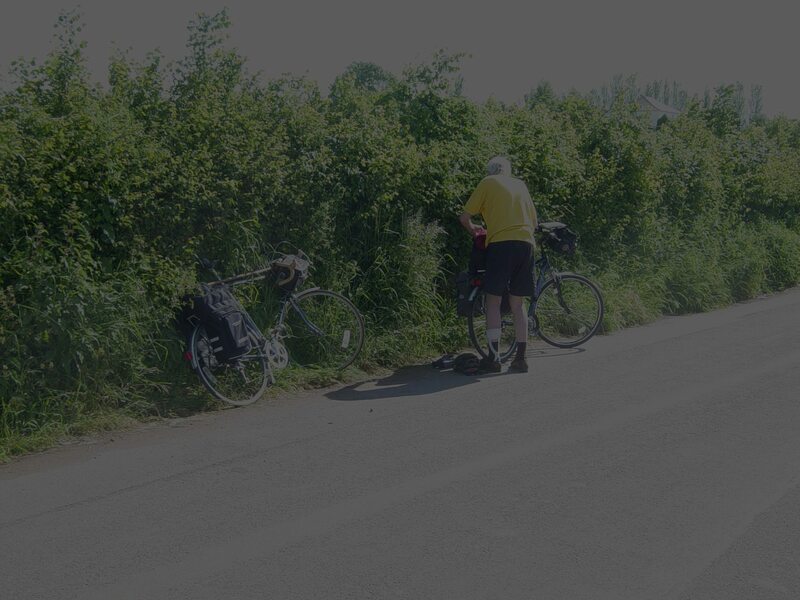 Next morning my rear tyre was flat and I repaired the puncture so I still had two spares. With my narrow tyres I needed this extra insurance as finding a puncture with no water tub is not always possible. So we set off late and things got worse. The route was very up and down so we were forever off the bikes pushing. An error in our navigation saw us pushing up the highest hill around until a friendly lady jogger put us right and suggested an alternative route. Lunch was at a pub on a busy corner next to an industrial estate. The afternoon went better and we arrived back in Leominster and found accommodation in a pub we’d thought worth a try on our last visit. We were quite tired by now and grateful that we didn’t have further to travel. I had been concerned about the next day as I had a train to catch, which would leave me stranded if I missed it; but my attitude changed and the anxiety went away. In fact we cycled the 18 miles back to Chris’ car next day in under 3 hours in bright sunshine and had 2 hours to kill before my train. It was good to finish on a high note. We had lunch nearby and made our farewells with me cycling to the station and Chris driving back to Plymouth. The whole trip was a great success, a triumph over his disability for Chris. 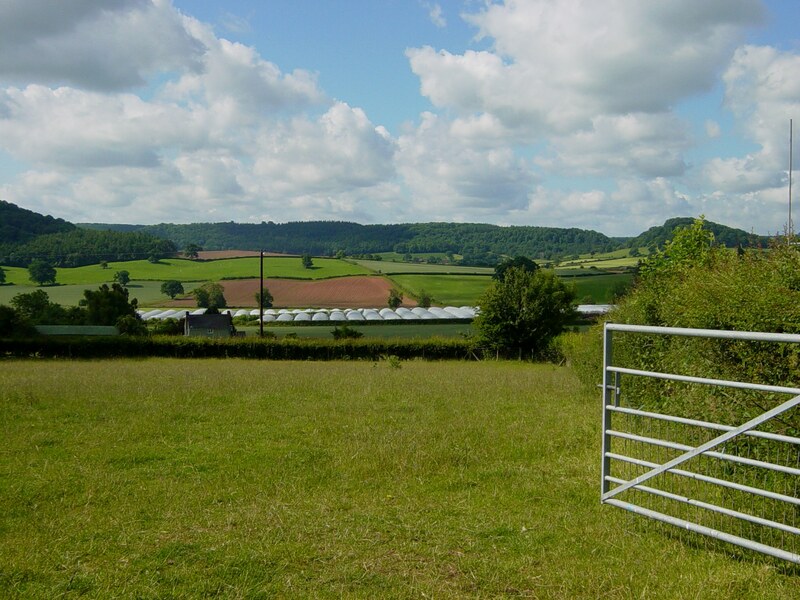 The countryside was beautiful with cider orchards, hop fields and swathes of polythene tunnels as well as woods, hills and the Rivers Lug and Wye. The towns, villages and countryside had many lovely Elizabethan and Georgian buildings to admire.